Not only beautiful to look at but functional too. 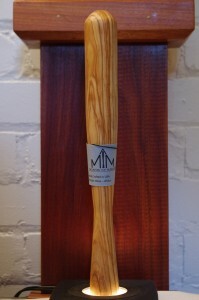 Notes: Overview: MTM muddlers are bar muddlers made in Atlanta Georgia. They come in a variety of exotic woods such as Zebrawood, Canarywood, African Paduak, Amaranth, Cocobolo, Ebony , Leopardwood and Olive wood (Olive wood is what Laguiole uses on those investment grade quality corkscrews). In this instance we are testing and evaluating the Mountain Top Olive Wood Muddler. Appearance: Nicely made and well finished product with a nice grain to the wood. Good attention to detail,f finish and design. Already treated (with food grade mineral oil) and ready to use. First Impression: Much longer (11 1/2 inches) and larger (1 1/4 inches across bottom, business end) than most muddlers makes it a joy to use – a lot more leverage and coverage, and fits the hand nicely. Bottom is relatively smooth (not checkered, serrated, grooved, crosshatched, etc., ) so it does not shred and pulp ingredients into a free floating mess but has enough end grain to bruise ingredients nicely. Nice balance and feel to it .Big enough to use as a weapon in a pinch and also harder to lose track of than those toothpicks that some people call muddlers. Testing: Worked well on a variety of drinks, larger end/grinding surface make it simple to thoroughly muddle ingredients and still maintain control of a glass. Some of the smaller ones can go sideways and send a glass shooting off onto the floor. Also the overall size is big enough that your hand doesn’t feel like a claw after a shift and small enough to be comfortable. Good tight wood, well treated before shipping makes clean up a breeze, not untreated wood or finished with god-knows-what like some other muddlers muddlers I have seen. MTM’s choices of wood would all hold up well to the task without chipping, denting, or getting fuzzy as they are all extremely durable hardwoods. Also not being metal they will not react with anything in a drink, corrode or leave bits of metal or plating in a drink . Easy clean up and maintain. Final Thoughts: First off I must admit that while I acknowledge that I have a weakness for a nice piece of wood over a piece of plastic. Yes, a muddler like the Viva ! Is a great tool – especially for high volume situation and can be thrown in a commercial dishwasher, but a natural wood muddler, especially a well made one, made from a good and interesting wood is a wonderful thing. The difference is like between a pick up truck and a sports car – one is great for heavy duty work, large loads and plowing snow, the other has grace, style and aesthetics, or maybe a rental type polyester tuxedo that is durable, works and is easy to clean versus a Brooks Brothers wool tuxedo made for you. Both work well but the latter, while possibly requiring a little more care, has much more style, beauty, and owner satisfaction from knowing they own a quality piece of craftsmanship. All said a well made piece of equipment, and unlike the plastic muddlers that are out there, something you can enjoy looking at and appreciate for its natural beauty when you are not using it. A serious bar tool that would be a great addition to any bar home or professional as it is well made, works well and hard to break. Yes, as a handmade piece it costs more than the cheap mass produced stuff but it is a lot infinitely better made and will probably last a lifetime. Would make a great gift for the bartender or drinks enthusiast in you life.